You can not hear sound? Disable any software or hardware-based switches that mute the ringtone. Open settings with the menu button on the left top and navigate to "SCENE". After installing the app all available scenes for your subscription plan are downloaded from our server. This might take a few seconds. IMPORTANT! Make sure you are online at that time. Normally, the app tries to load new available scenes. If loading is not possible, only the one stored on your device will be used. NOTE: if you just downloaded the app you will get only scenes, that allow to test, if the app is working on your device. If the app works well on your device, you can purchase an annual subscription in the UPGRADE section, which gives you access to all available scenes. To start a scene tap onto it and then hit START. Some scenes offer the option to skip the intro. That will bring you closer to the final docking position instantly. 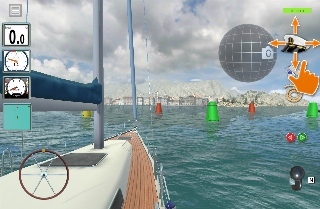 Dock your Boat 3D is not freeware! Starter Subscription will activate all current and future scenes for 1 year. 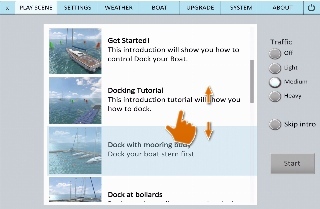 With the option to buy "Boat settings", "Weather" and "Bow-Thruster" as Add-Ons. These features will stay active forever then. 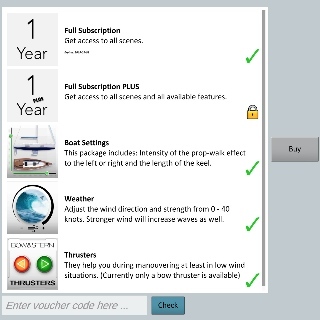 Full Subscription PLUS: This subscription will also activate all current and future additional features for 1 year at a reduced total price. In drone mode, the camera will rotate back when you release the screen. 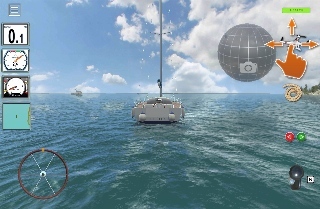 When you stand on the boat, the camera stays in that view. Should the app be in VR-mode, then this will calibrate your view. Hold and drag the drone symbol. 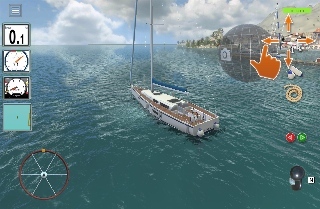 This will display a ball indicating the current position of the drone relative to the boat with a camera icon. Dragging the ball down will bring the drone behind the boat. Dragging the ball to the left will bring the drone to portside and to starboard when dragged all the way to the right. Dragging the ball up will bring the drone high above the boat. Notice that you only have to watch the ball to set the drones position. It may take some seconds for it to hover to that location. Dragging is sensitive! Play arround to get a feeling for it. 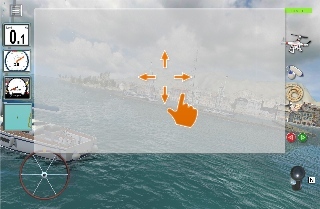 Hold and drag the captains cap symbol. 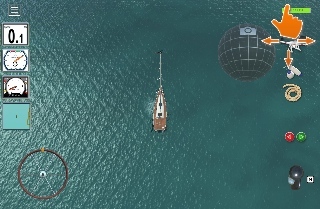 This will display a ball indicating the current position on the boat. Dragging the ball will move your position on the boat. 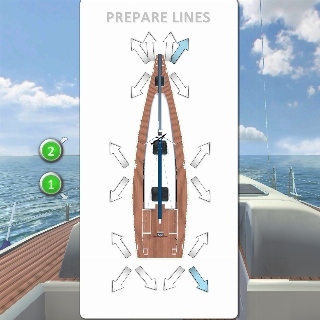 The concept is like in real life: as a skipper you usually cannot handle all lines by yourself. 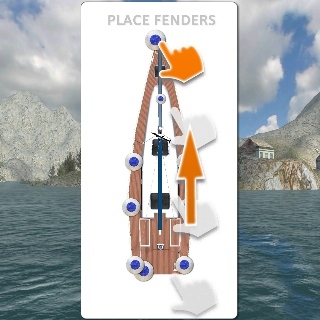 As soon as you know where to berth you should come up with a plan where you need lines and where to put fenders. 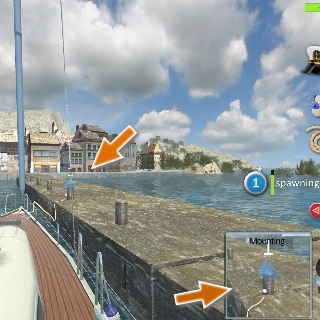 So you take some time and think about what the wind will do to your boat and how to approach the docks. You even want to stop the boat to do so. You open the line preparation panel by tapping the line icon on the right. Now select the arrows that point in the directions in which you want to attach the lines. As you do so, green buttons will appear. You will need to press these later to command your "crew" to attach them. Close the panel by tapping outside of it. When a desired clamp approaches a mountpoint (bollard or buoy), the button starts flashing and indicates the distance to the mountpoint. The mountpoint itself is marked with a green bubble. The app tries to determine which point is closest and makes the most sense. If you decide otherwise, you can cancel the docking maneuver at any time and change the positions of the lines in the panel. If you tap on the green button, the respective line will be deployed. Of course, this will only work if you have done the mooring properly, otherwise it will crash after 15 seconds and you can try again. A small window at the bottom right shows a close-up of the action. At the same time a blue button appears for each line showing its status. A line is tight when the vertical bar next to the blue button shows green. A line can be adapted by tapping a blue button. This will bring up a control panel. 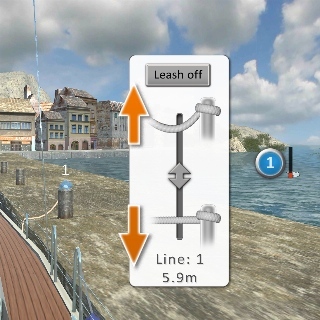 Tap "Leash off" to unmount the line. The line is then slowly been pulled onto the boat. Move the slider up to ease out the line. Move the slider down to tighten the line. This might not always be successfull because the force is too high. In that case you have to help with the engine! In docking scenes it is necessary to have all lines tight. So all the line buttons have to show a green bar. In some situations the default position of the fenders might not be perfect to protect your boat from damage. Open the fender panel by tapping the fender icon. Notice that you have 2 big fenders at your stern and 6 smaller fenders on either side. You can drag fenders around on the panel. Notice that it may take a while until your crew has fixed all the fenders. You can close the panel at any time and do not have to wait until it is finished. 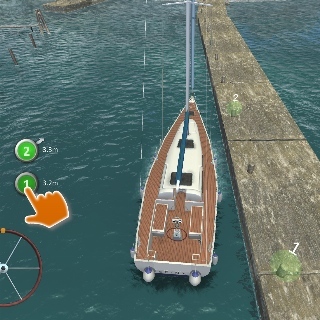 Pro tip: use a big fender on your bow, if you plan to dock alongside!